A recently discovered rifle signed on a silver plate on the barrel “Jno Wilson Craigs Creek BC” ends much speculation about where John Wilson worked later in his career. Stylistically related to rifles made by central Tennessee gunsmith's Thomas Simpson and Jacob Young, it appears Wilson worked closely with them when he made this rifle. Examples of his later work show a change in stock architecture assimilating the Botetourt County style. Regardless of place of manufacture this rifle is exquisite. The 2-piece cast brass patchbox has a hidden hinge lid with a wonderful bird finial. It is engraved in the style similar to Simpson and Young as is the long toe plate. Notice the bird’s foot is engraved over top of the iron screw. Usually the gunsmith avoids the screw heads but Wilson ignores that tradition and uses the screw head as part of his pallet. He realized that making his patchbox very substantial the screw would never need to be removed! The original length barrel (49 inches) is signed on a decorative silver plate “Jno Wilson”. 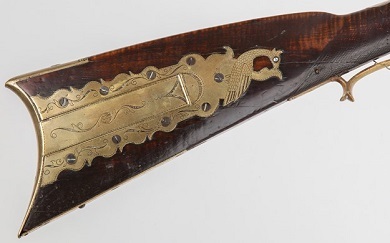 The plate has pointed finials on both ends exactly like the newly discovered rifle. Elliptical silver eschuteons protect the forestock from the wedge pins. Minor repairs commensurate with use are the only apologies. The surface retains its original finish with beautiful patina.